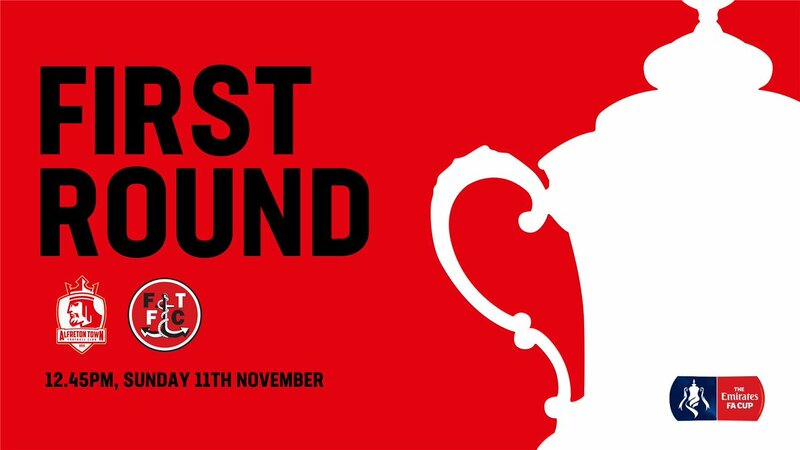 Alfreton Town return to Emirates FA Cup action with a huge tie as League One Fleetwood Town visit the Impact Arena tomorrow, kick off is 12.45pm. The Reds face their biggest game of the season thus far and also a reunion with Fleetwood for a fixture, for the first time in six years. The Reds will look to use tomorrow's occasion to not only aim to cause an upset but also springboard themselves back into league contention after a recent month of poor league results. We head into tomorrows tie off the back of three straight draws in all competitions with our last outing being on Tuesday night against Glossop North End in the Derbyshire Senior Cup. This gave vital minutes to the likes of Tom Nicholson, Josh Gowling and Callum Chettle as well as a platform for players in the Development Team including stand out peformer Kieron Hinchley. We progressed on penalties 5-4, after a 1-1 draw in 90 minutes, Josh Gowling giving us the lead after 20 minutes with a header from a corner and Tom Nicholson making the decisive save in the shootout. Recent league results have seen us pick up back to back draws at FC United and at home to Telford United last Saturday. These draws have ended a sequence of five league defeats in a row and have at least put points back on the board for Billy Heath's side. It's a case of a glass half empty or half full with the Reds two league games unbeaten but in turn, seven league games without a win. Our journey to this stage has seen a 3-0 replay win over Sutton Coldfield Town in the Second Qualifying Round at the Impact Arena after a 2-2 draw in the intial fixture at Coles Lane. A trip to Mickleover Sports followed in a local derby in the Third Qualifying Round and we secured passage thanks to a Jordan Sinnott penalty and a Richard Peniket finish in a 2-1 win. A 4-0 thumping of St Neots in the Fourth Qualifying Round with a dazzling first half display, saw us progress to the First Round proper for the ninth time in our history. League One visitors Fleetwood Town make their entrance at this stage of the competition and currently sit in 12th place in the League One table with 23 points, five off the play-off positions. The Cod Army's current form has seen them lose three of their last four league games including a 3-0 defeat at Gillingham last Saturday, Fleetwood have also lost their last three away contests without scoring. "“We have to use this game against Fleetwood as a positive and try and take momentum into our league matches. It is currently seven games without a win in the league, but we have won the cup games that have come in between. “Sunday is a big occasion for our players and the football club and it’s important that we give a good account of ourselves and hopefully improve on performances that we have produced in recent weeks. BBC Single Camera footage and updates via BBC Sport Final Score which starts at 12.30pm. Highlights on BBC Two at 5.30pm. Adults £14, Concessions £10, Under 16s with paying adult £2. Please note that this fixture is SEGREGATED. Fleetwood fans can enter the Impact Arena through the Alma Street entrance. There is now limited parking available next to the Impact Arena, we recommend allowing extra time to travel to us. There is parking available in the surrounding streets but please be respectful to our neighbours. There will be road closures in Alfreton Town Centre due to Remembrance Day between 10.30am to 11.30am tomorrow. For those travelling from the A38, use the Somercotes exit. We look forward to welcoming you all for this huge FA Cup tie!